No.3 "2nd Air Division USAAF"
Designed and constructed by John Edwards in 1988 in preparation for assisting in the construction of the line. 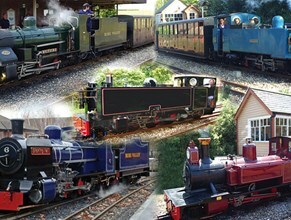 No.3 is used all through the year on passenger duties, permanent way trains, route learning courses and general work. At Christmas the locomotive is often used to haul Santa's Sleigh into Aylsham Station. Originally built by Hudson-Hunslet as a two foot gauge, four wheel industrial locomotive. The loco has now been completly rebuilt and re-gauged, with an hydraulic drive. It's principal job is Aylsham yard pilot, track work motive power including help to flail the line using the railway's flail machine. Originally 2ft gauge and used on Fisons peat railway on the Somerset Levels. Now converted to 15" gauge. This loco is mainly used within Aylsham Station for shunting.